BEIJING, Oct. 19 (Xinhua) -- Chinese Vice Premier Liu He on Friday answered questions from domestic media about economic and financial hot issues, underlining the resilience and prospect of the Chinese economy. Liu, also a member of the Political Bureau of the Communist Party of China (CPC) Central Committee, said many factors had caused obvious stock fluctuations and declines in China recently, including interest rate hikes by the central banks of major economies and Sino-U.S. trade frictions. The global stock market started seeing fluctuations and downward movements after the interest rate increases, and the U.S. stock market has also seen obvious corrections, said Liu. "Sino-U.S. economic and trade frictions have also impacted the stock market, but frankly speaking, the psychological effect is bigger than the actual impact," said Liu. Apart from external factors, China's economic restructuring has also had an inevitable effect on the stock market, according to Liu. Changes in market expectations and uncertainties over the future economic environment also influenced the behavior of investors, who are very concerned about issues such as the development of the private economy and property rights protection. In addition, some technical factors existed, said Liu, citing passive reduction of stock positions amid market slides as an example. Citing international investors and domestic analysts, Liu said China was becoming the most valuable market for investment, from the perspective of global asset allocation. Market bubbles have sharply contracted, the quality of listed firms is improving, while valuations are at historic lows, he said. "Many institutions therefore suggest that great attention be given to Chinese bourses, believing that China's stock market already has a relatively high investment value," Liu said. With the aforementioned evaluation, Liu said that he believed investors would make rational judgments. "The corrections and sell-offs on the stock market are creating good investment opportunities for the long-term and healthy development of the stock market," he said. Liu said the government highly valued the healthy and stable development of the stock market. Noting that investors had strong expectations for institutional innovations and reforms, Liu stressed the importance of working out new targeted reform measures to promote healthy development of the stock market. He expounded on policies and measures announced Friday morning, in the areas of stabilizing the market, reforming market institutions, encouraging long-term funds to enter the market, facilitating reforms of state firms and development of private firms, as well as further opening up. "The country will continue to open its doors wider on all fronts and accelerate the opening up of banking, securities and insurance industries," he said. Noting that this year marked the 40th anniversary of China's launch of reform and opening up, Liu said major policies and principles of reform and opening up had already been set and it was key to implementing them well. "Now we have arrived at the crucial point where one action is better than a dozen principles," he said, urging all sides to make greater efforts, have a stronger sense of responsibility and move fast to roll out concrete policies for the healthy development of the stock market. Liu acknowledged that misunderstanding and deviation existed in implementation, citing a viewpoint of some lenders that it was safe to provide loans to state-owned enterprises (SOEs), but politically risky to loan to private businesses. "We must pay high attention to the difficulties faced by micro, small and medium-sized enterprises and roll out precise and effective measures to help them," he said. 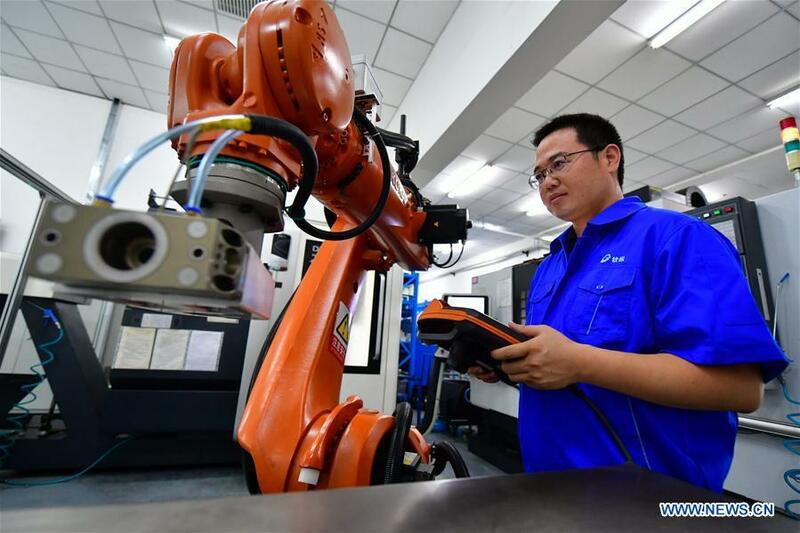 "Efforts should also be made to help private businesses improve their own capability and adapt to market changes, and achieve high-quality development," he said. Liu said SOEs are in an interdependent relationship with private enterprises, where there is mutual support and cooperation. The discussions about the so-called "Guo Jin Min Tui," the Chinese phrase describing a situation where state firms force a retreat of the private sector, are "one-sided" and "wrong," he said. Recently, state-owned banks or enterprises are helping and even restructuring private firms which are in liquidity crunch after expanding too fast at the costs of excessive debts and deviating from their main business. "I believe this is a good thing, not 'Guo Jin Min Tui'," he said. SOEs, most of which are in the upstream of the industry chain, play roles in basic industries and heavy manufacturing, while private enterprises are more involved in providing manufacturing products, especially final consumption goods, said Liu. "The two are highly complementary to each other with mutual cooperation and support. In the future, the Chinese economy will continuously upgrade in this direction to high-quality development," said Liu. If private enterprises are in a good business condition, state-owned capital can withdraw, and SOEs can increase efficiency by enlisting the participation of private enterprises when facing difficulties, said the vice premier. "We also encourage qualified private enterprises to conduct mergers and acquisitions of small and medium-sized enterprises in the same industry with competitive potential but confronted with difficulties," said Liu. Liu stressed that the Chinese government will create an equal environment, intensify the rule of law, strengthen property rights and intellectual property protection, stick to the basic economic system and deepen reform and opening up. Liu said the country will strive to maintain steady economic growth and properly ward off financial risks with the macro leverage ratio kept relatively stable. The key to striking the balance is to properly implement the country's policies with supply-side structural reform at the core, he said. "The Chinese economy has generally maintained stable performance with an improving growth momentum," Liu said. "Measured by major indicators such as economic growth, employment, consumer prices, international balance of payment, enterprise profits, fiscal revenue and productivity, China's economic growth remains within a reasonable range," he said. However, Liu noted that "the country's economic structural adjustment has yet to be completed, and supply-side structural reform needs to be further advanced." Looking ahead, the vice premier said focus should be put on enhancing the vitality, resilience and creativity of micro entities to push forward economic transformation and upgrading, and to facilitate a virtuous economic cycle. The country will step up efforts to support the development of private companies by raising financial accessibility and relieving their burdens, and to deepen SOE reform, especially mixed-ownership reform, so as to enhance SOE competitiveness, Liu said. Work must also be done to make the financial system more adaptive, and enhance its capability to serve the real economy, the vice premier said. "Under the current circumstances, we should particularly accelerate institutional improvement and give full play to the key role of the capital market," Liu said. China's economy may seem to be in some difficulties from a short-term perspective or being viewed through specific cases. However, its development prospects are very bright when being judged from a historical perspective, according to Liu. The economy is currently going through a structural transformation that comes with a transition from traditional driving forces to new ones, he said. It is hard to clearly describe the transition, but several things are clear from the country's demand side: huge demand is being created by a large and growing middle-income group, an aging population and a new round of sci-tech and industrial revolutions; and opportunities are being generated from green development. "China must identify and seize new opportunities to transform traditional industries, foster new sectors and step up the building of a modernized economy," Liu said. "Under the leadership of the CPC Central Committee with Comrade Xi Jinping at the core, it is a historical trend for China to realize peaceful development," Liu said, adding that the difficulties and problems the country encounters are a natural part of development. "As long as we keep this in mind, we will stay calm and China will surely have a better tomorrow," Liu said.